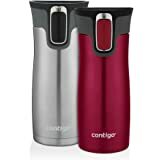 Amazon's Choice for "contigo autoseal"
Contigo autoseal west loop mug is made from vacuum insulated stainless steel body and bpa-free plastic lid. Lids are sealed and autoseal technology is leak and spill proof. Drinks stay hot up to 5 hours and cold up to 12 with thermalock vacuum insulation. Easy one-handed drinking with the push of a button. Easy clean lid completely opens for an extra squeaky clean with no separate parts to take apart or misplace. Autoseal button lock for added peace of mind. Autoseal is Americas 1st selling line of travel mugs. Made for the modern movers, shakers, commuters and travellers. Fits most car cup holders and under most single serve brewers. Top rack dishwasher safe lid and hand wash body. 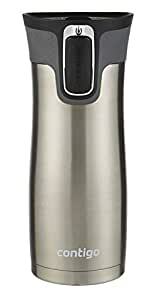 Available in stainless steel colour and 473 ml capacity. It knows when to close - West Loop is made for the modern movers, shakers, commuters, travelers – and for the urban explorer in all of us. Whether you're traveling through car, train, horse drawn carriage, rickshaw or penny farthing this mug is the ultimate in convenience. 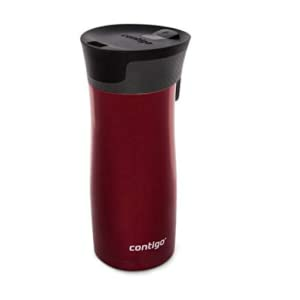 It's spill-proof, will stay piping hot for hours and it's easy to use with just one hand. Our Lids Are Sealed – AUTOSEAL technology is leak and spill proof. Lend a Hand – Easy one-handed drinking with the push of a button. Squeaky Clean – Easy clean lid completely opens for an extra squeaky clean with no separate parts to take apart or misplace. Lock it Up – AUTOSEAL button lock for added peace of mind. Perfect Fit – Fits most car cup holders and under most single serve brewers. Clean Up – Top rack dishwasher lid, hand wash body. 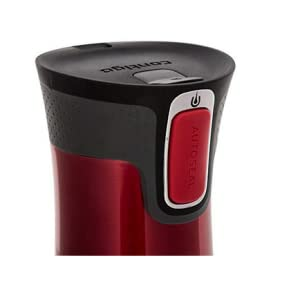 Autoseal feature is very convenient and ensures a dropped thermos doesn't spill. Excellent at keeping my coffee hot for my commute. 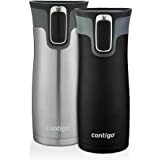 It may say Contigo on the side, but it should say keep contents hot. 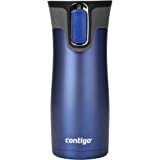 Easy to clean, keeps drink from spilling. What more can I say. I work night shift this thing keeps coffee hot for hours in to the night. I bought the coffee mug for my daughter, she love's it. 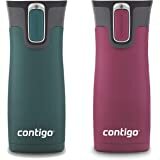 5.0 out of 5 starsExcellent spill free travel mug. Spill free, great for coffee on your commute. 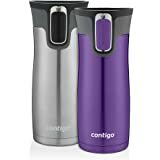 Does what it says-no leaks and keeps coffee hot for hours.